A Chandra X-ray Observatory image of the supernova remnant Cassiopeia A, with an artist's impression of the neutron star at the center of the remnant. The discovery of a carbon atmosphere on this neutron star resolves a ten-year old mystery surrounding this object. 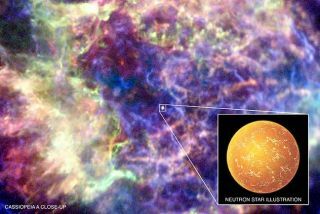 The supernova remnant Cassiopeia A, one of the youngest inour galaxy and one that has long puzzled astronomers, is likely a dense type ofstar called a neutron star swathed in a carbon atmosphere, a new study finds. Cassiopeia A, a remnant of the explosion of a star that onceshone brightly, is thought to be just 330 years old based on observations ofthe constellation in which it sits by Britain's first Astronomer Royal, JohnFlamsteed, in 1680. Astronomers didn't get their first actual up-close glimpseof the core remnant, which lies about 11,000 light-years away, until 1999, whenthe ChandraX-ray Observatory imaged thecollapsed star. "Before then it was thought there's probably going tobe either a neutron star or a black hole in the center of this object, but itwasn't sure what ? nobody had seen it," said Craig Heinke of theUniversity of Alberta in Canada and a co-author of the new study. With Chandra"we were actually able to pick out something at the center." But even with a closer view of the object, it still puzzledastronomers: "The properties of this object were a little strange,"Heinke said. In particular, the star's spectrum ? the amount of energy itradiates out at each wavelength of light ? implied that the star's radius waseither much too small for a neutronstar (only 0.1 miles [0.2 km] in radius, instead of the accepted 12 miles [20km]) or that the high-energy emission seen from it was coming from hotspots onthe surface, not from the entire face of the star. But radiation from a hotspotwould appear as a pulse as the star rotated, and no pulsations were seen in thestar's radiation. The star also had a low magnetic field, which would beunlikely to drive any pulsing behavior. Since a pulsatingstar with surface hotspots seemed to be out of the equation, Heinke and hiscolleague Wynn Ho of the University of Southampton in the U.K. tried to find away to tackle the size problem. To do this, they first added an atmosphere to models of thestar. They first tried a hydrogen atmosphere, as it was thought that in theextreme gravitational field of a neutron star, the star's layers would quicklystratify, with the heaviest elements relegated to the interior and the lightestto the outermost layer. Hydrogen, of course, is the lightest element in theuniverse. A hydrogen atmosphere ballooned the star's size up to 2.5miles (4 km) in radius ? better, but still not big enough. Trying a heliumatmosphere also "helped, but not very much," Heinke said. Next on the list was carbon, and sure enough, that gave aradius in the models "that was in the right ballpark for neutron stars,"Heinke said. But that left the researchers with another question: How didthe star end up with an atmosphere made up entirely of carbon? "This is the youngest neutron star that we have everobserved," Heinke said. "The fact that this is so young means thatit's been really, really hot the most recently of any neutron stars." As the star gets older, it will cool substantially andeventually stop burning the hydrogen and helium into carbon and develop ahydrogen atmosphere, Heinke said. He and Ho plan to test this model on other known youngneutron stars to see how well it holds up. Their findings are detailed in theNov. 5 issue of the journal Nature.